I haven't been on holiday to Cornwall for about twenty years, however I can imagine there are a huge amount of people surfing and enjoying the coast on this baking hot weekend. Bought from the farm Shop at Gloucester Service Station, this Neet Light Ale has a nautical theme with a ship and a lobster on the label. At 3.7% volume this ale was produced by the Bude Brewery and named after the river that runs through the Cornish town. Personally I've never been there, but it's a popular holiday destination and by the photographs on the internet I can see why. On opening there was a keen mixture of sweet malts and fruitiness from the hops. This is certainly lively amber ale exploding into my beer glass with intense fervour. And a jolly light ale this is. Nose in glass produced a fruitiness that smacked of elderflower slightly overbearing the sweet malts I'd smelt on opening. On taste this Neet amber ale's hoppy bitterness pounces on the palate with lovely fruitiness washing around my mouth and then joining with those luscious sweet amber and caramel malts into the aftertaste. This is a truly tasty delightfully refreshing light craft ale. Perfect for a hot sunny day in the garden or lazing on a sandy beach somewhere by the sea. I may have to amble down to Bude to get another few more bottles sometime. 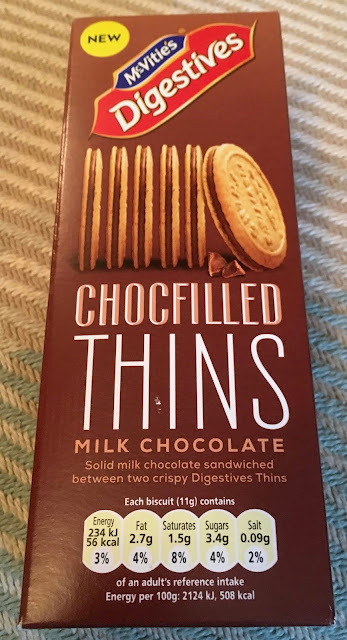 I didn’t think I would be revisiting Thin biscuits as a concept, I feel we have already given them quite a bit of coverage. 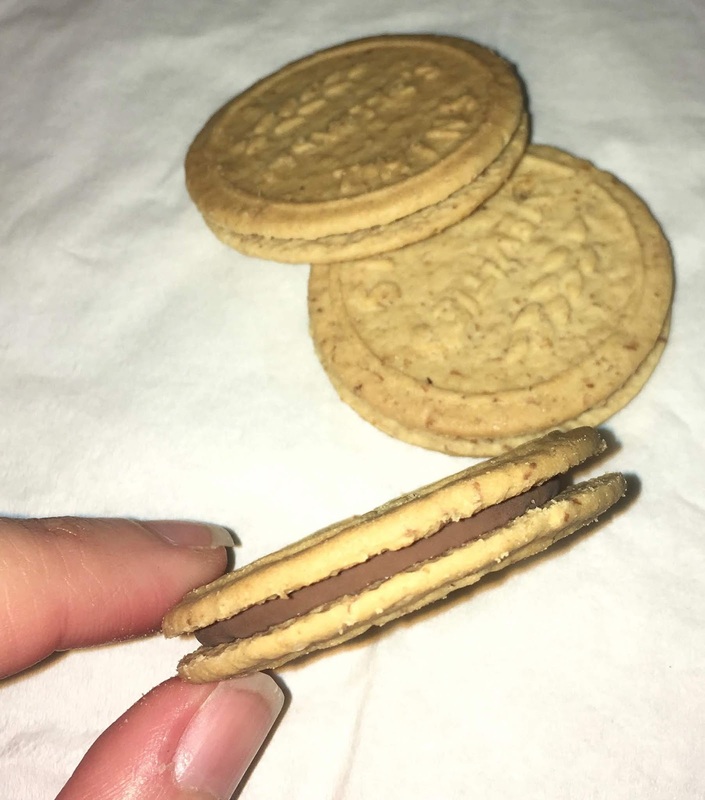 However new is new, and these particular ones from McVities are now double layered and chocolate filled; well “chocfilled” as the packet seems to have made up a new word. There are 12 biscuits in the pack, and although they are still thin, they are a bit thicker as they have some chocolate filling and a double layer of biscuit. This also means the calories are increased and each biscuit has 56 calories. It’s hot again, and British people don’t cope well with that. Luckily we have a freezer at work and hit the supermarkets before the shelves were cleared. Today we have these J20 frozen smoothies. Yeah - it’s basically a sorbet on a stick, which is cool. And oddly it’s saying it’s a smoothie, when J20 itself is more of a juice. You get three individually wrapped sticks of cold fruit. And they look pretty psychedelic! The taste is fruity and the texture very soft and inviting. They are just a little too big and it all gets a bit acidy and samey at the end, but I think if you were out this would be a very refreshing alternative to a cold drink. I’ll try to grab a berry flavour one for comparrison, but if you want a non dairy cold thing on a stick then it’s worth a shot. I'm not sure why Cinabar passed me this drink to blog about. I must have upset her somehow. I'll have a think back for a moment… nope, I've got nothing. However, if you ask Cinabar she can go back twenty years and name any number of things. A long list of stuff I can't remember. I reckon most of that stuff was a different guy anyway. 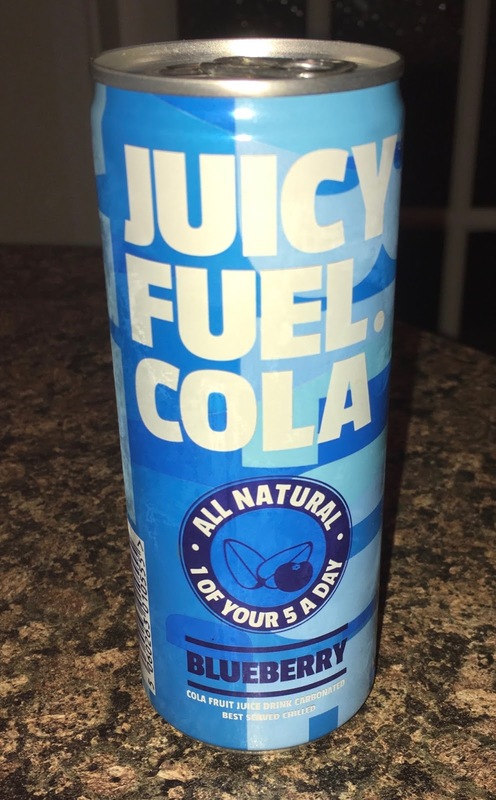 Blueberry Cola… Seriously? I don't like Cola, let alone Blueberries! Having said that, looking at the ingredients below and there's far more white grape than there are blueberries in this drink. There's even more lemon than blueberries, but to be fair that's a pretty small percentage. I guess calling it "White Grape Cola" would be like the mayor in Jaws saying "You say Barracuda, people say what?" Okay, so on opening this Blueberry Cola (made by Juice Shed in Cheshire) it smells slightly like one of those popup ice lollies I used to have when I was a child (or man-child if I saw one now). I think they used to make my tongue go blue (although I am getting old now). I bizarrely liked the blueberry flavour the best back in those days. The green was okay, red and orange were okay too, but blue was the clincher (although Cinabar tells me they were bubblegum flavour)! It also harkens back to those pull open ridged plastic cartons that used to be about then from the corner shops. They were really cheap and you had to punch a hole in the plastic top of the ridged plastic carton to get anything out. Orange was my favourite of those. Ah, to be young again on hot summer days… Anyway, I digress… this hot summer spell we're having seemed right for this fizzy Blueberry Cola. On pouring, it's actually more reddish in colour and tastes almost exactly like the Cola version of the popup ice lollies I mentioned earlier, which I'd totally forgotten was my real favourite. I'm actually considering freezing the second can into easily suckable ice cubes!! The 250ml can contains 50 calories per 100ml, with 0.1g of fat, 10.4g of sugar and 8mg of sodium. 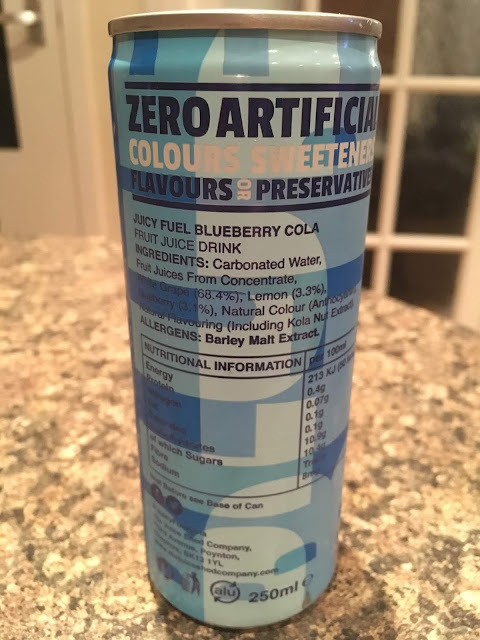 Ingredients includes no artificial colours, sweeteners, flavours or preservatives, and contain; carbonated water (3.3%), fruit concentrates from white grape (68.4%), lemon (3.3%), blueberry (3.1%), natural colour anthocyanin, natural flavouring includes Kola Nut Extract. Allergens: barley malt extract. Wow its hot, the sun is shining and even the heat at night isn’t something I am at all used to. So I decided to have a root around in the freezer and see if I could find any interesting ice creams stacked away. 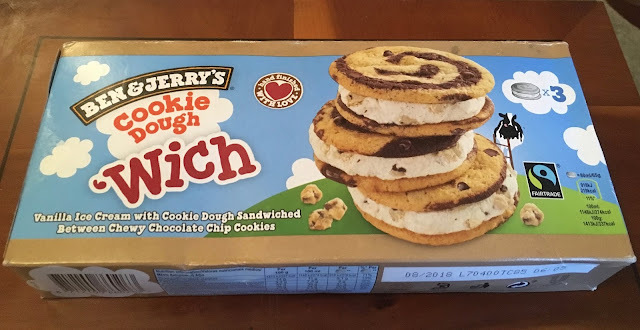 I spotted a box of these Ben and Jerry’s Cookie Dough ‘Wich, they are basically a sandwich of biscuits filled with a cookie dough ice cream filling, and they sounded perfect for this evening. I opened up the box and found that there were three inside in light blue packets, and they seemed quite chunky. 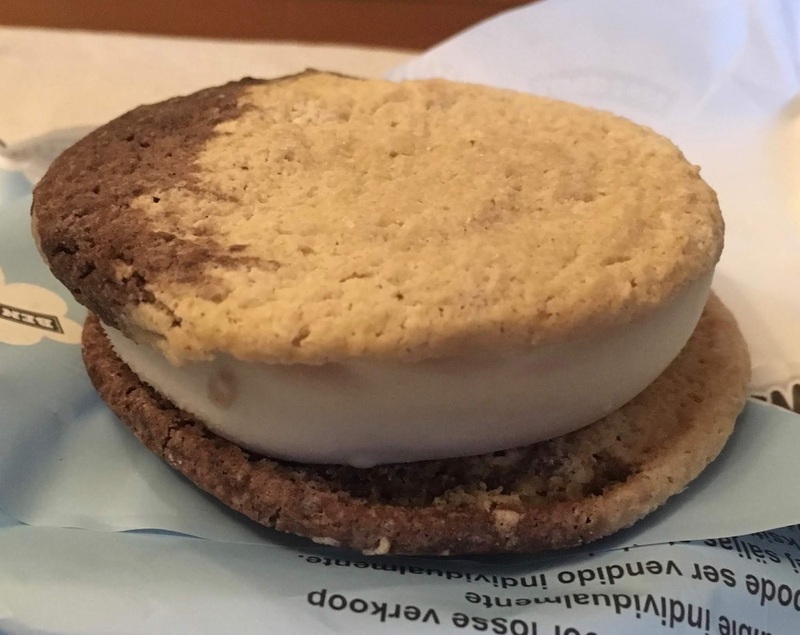 I opened up one of them and found that the swirl on the biscuit in the image wasn’t as smooth as the picture on the box, but otherwise they looked a decent size. I gave one the taste test and found the biscuit sides a bit disappointing. They were soft, but not in the way that American style cookies are soft and gooey, it was chewy, but I found I didn’t like the texture. The coldness made them feel odd to me. The ice cream in the middle was lovely though, it was creamy, and sweet and had a good biscuit flavour. The biscuit sides were a good way to hold the ice cream, but in my heart of hearts I would rather have had the ice cream in a pot with a wooden spoon! Oh well, it did cool me down in the heat, and it isn’t going to be too tough a chore to finish the others, its just not something I’d buy again. I would happily buy a tub of Ben and Jerry’s Cookie Dough ice cream though! I’m not the biggest football fan, in fact I merely check in on on how England are doing during big events like the World Cup and the Euros. Admittedly I keep an eye on our local team (Wolves) who have done remarkably well last season, but I’m far from being a super fan. Anyway football is quite a big thing and there are a number of limited edition products coming out to help us celebrate, which I’m more than happy to pick up. 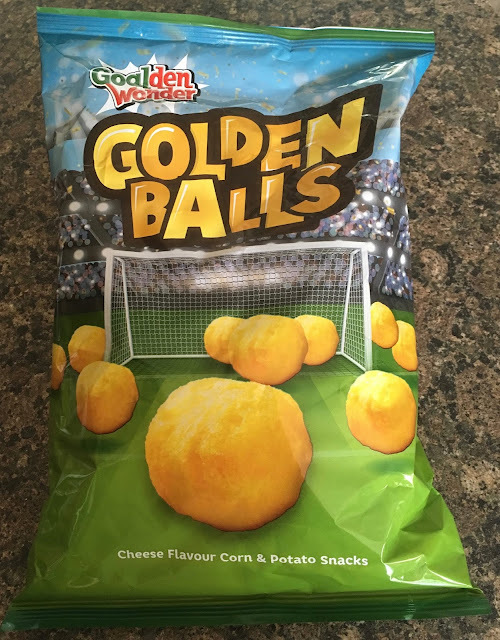 I opened up this bag of Golden Wonder Golden Balls Cheese Crisps/Puffs on Sunday, while England played Panama, and made their impressive win. 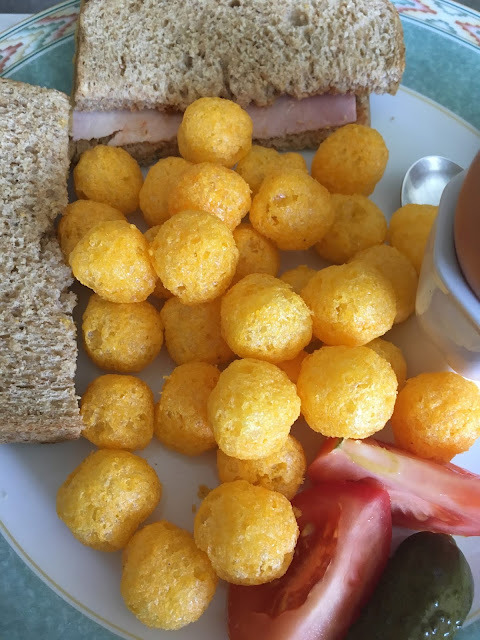 The crisps are as the name suggests spherical, and are light and crunchy to bite on. The cheese flavour is quite mild, and they are very easy going crisps. I guess this makes them easy to share, as the flavour isn’t strong enough to be offensive to anyone. For personal taste I would like the cheese to be a little stronger in flavour, but I still enjoyed munching on these. I also rather liked the light crunch from the texture, the shape made them fun to eat too. 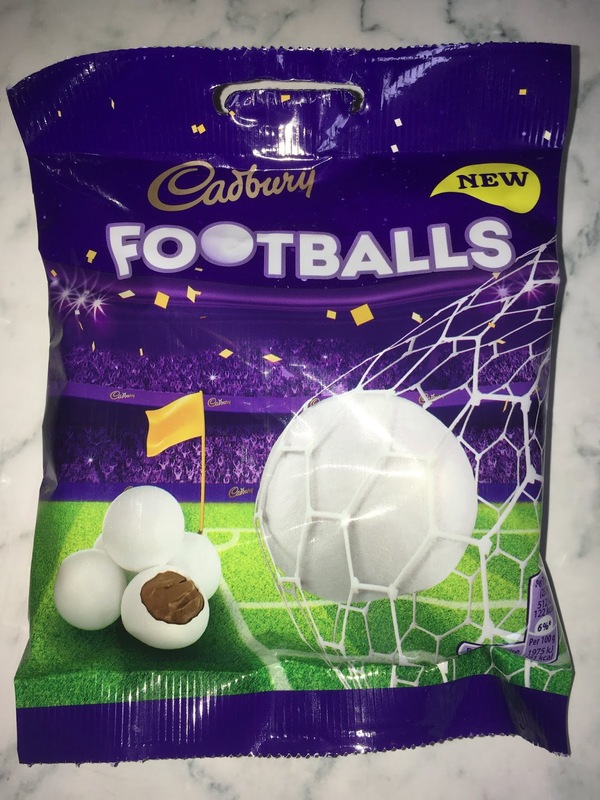 These would be perfect for pouring into a bowl while watching the footy, or even with lunch which is what we did. Sometimes you just want a simple drink when you are out. I fancied a water and had a few minutes before the bus to a show so I popped into Holland & Barrett. Paying a pound for a half size bottle of water always wrankles so I looked for other options. Here we have Rejuvenation. At £2.50 it was a little more than I wanted to pay, but after the abject dissapointment of Coke’s new tea water I figured I’d see if this was endemic of all bottled waters with a twist. Was this one worth twice what the tea cost? Yeah - the science blurb is shakey - I don’t Think they realise we teach this in schools, but the idea is at least a sound one. Consume amino acids, and replace what you used doing stuff. And yeah - this is mostly water, but so are we so we shouldn’t hold that against it. I think putting sweeteners into everything is a terrible idea, but the juice means this actually tastes pretty good. The rejuvenation is real and not caffeine related, and I vastly preferred it to the bad ‘on-tap’ cola that the venue had. Was it worth twice as much as just plain water when I didn’t really do much exercise? Not really sure it was, but I enjoyed the flavour and did wake up a lot so I’d be happy to keep trying luxury and interesting waters in the interests of blogging of course. Well it's early Saturday afternoon, the women's tennis is on, and what could be a better accompaniment than strawberries and cream? A strawberry flavoured cider, maybe, produced in San Sebastián, in Spain. 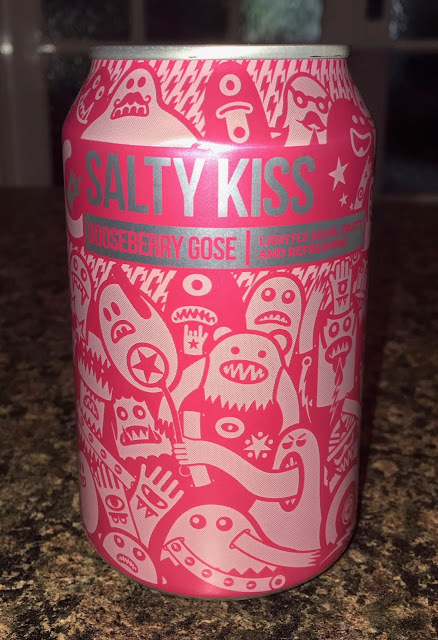 At 4% volume this sparkling deep pink cider has a strong sweet strawberry smell to it, with merely a hint of cider apple at the back of the smell. This concerned me a little as I do like a good cider (pun intended). I don't mind ciders flavoured with other fruits, as I've got used to blogging about them over the passed few years, but I prefer to be able to taste the cider apple, with whatever fruit has been added in the brewing very much as a secondary flavour. The fact with this strawberry cider was that I could barely smell the cider. 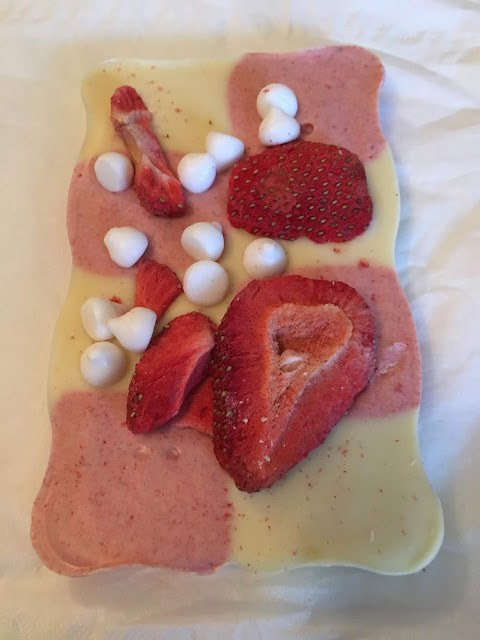 There was indeed strong sweet strawberries to start with dominating the flavour, however the apple cider poked through the secondary fruit and finally won through into the aftertaste. This cider with strawberries certainly tasted like the perfect refresher for a lazy afternoon watching two young ladies bouncing up and down playing with balls and rackets. Primoroso! My mum spotted this new bar of chocolate in Waitrose as part of its new own brand range of luxury bars, and bought it for us to try. 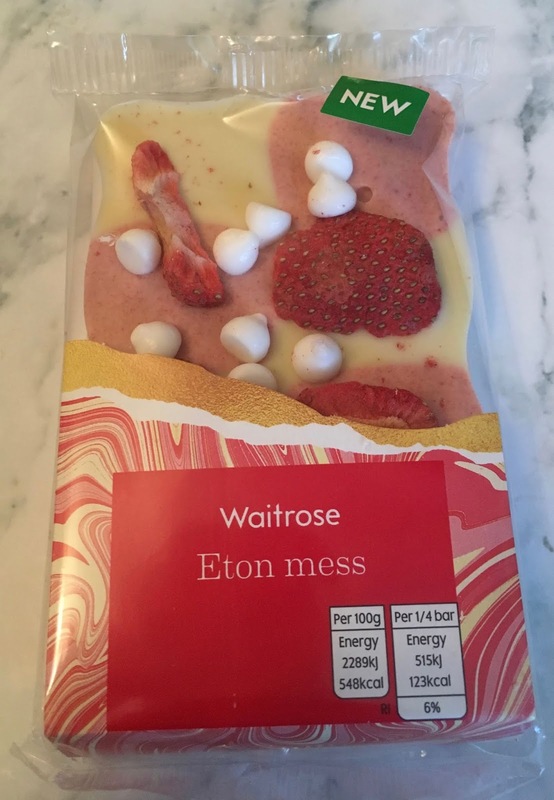 The chocolate bar is called Eton Mess, and consists of white chocolate squares, chequered with strawberry white chocolate and topped with dried strawberry and meringue drops. The bar is visually very pretty, and the flavour combination couldn’t be more summery if it tried. I think we were a bit late to the party on these as they are for Pride - you see Skittles have removed their rainbow so that the only one visible is on the Pride flag! One of our group thought that it was a really good idea because you got to colour your own Skittles in - while there are non-toxic pens available I don't advise this. The flavours are the same as usual, just identifying them is a bit harder. It's basically like you are eating the Skittles in the cinema! They still have a little S on them, so I think that counts as the one artificial colour listed on the bag! 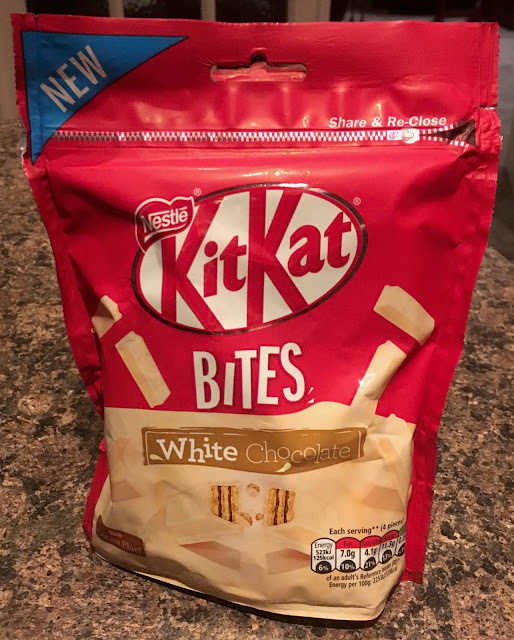 They taste the same, probably are slightly better for you with no colours, and are for a good cause AND we got 350g for £1.50 which is great! Hopefully we spy these again. Buttermilk were established in 1964 in Padstow, Cornwall, producing Artisan Confectionery. They have sprinkled Tregothnan Cornish Earl Grey Tea over this crumbly fudge. 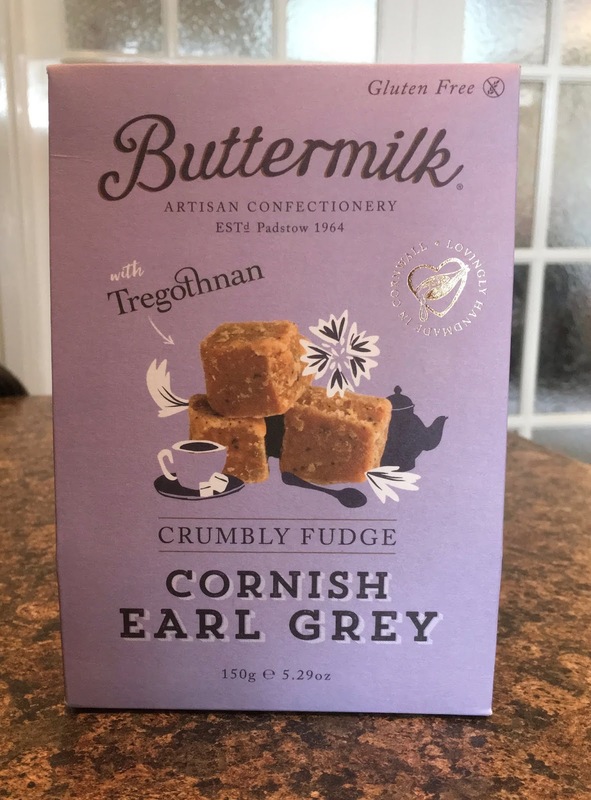 What could be better to wash this Cornish Earl Grey Crumbly Fudge down with than a mug of Earl Grey Tea? I can't imagine. So after brewing a mug of one of my favourite teas, I sat down to savour one of my favourite types of snacks for my after dinner pudding. On opening the packet there was a decent sized bag inside full of unevenly chopped mid brown fudge. There were freckles of tea leaves dotted around the outside of the fudge blocks. 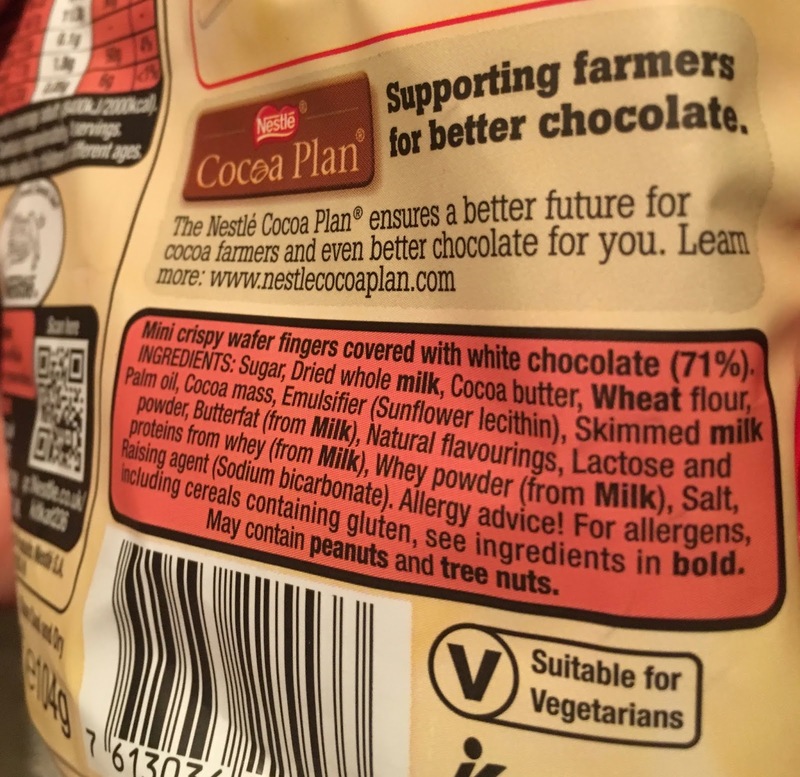 On opening the packet there was the unmistakable sweet smell of butter fudge. A smell that takes me back to childhood holidays spent on the Cornish coast. A smell that now reminds me of my dad and times spent with him jumping amongst the rock pools, whilst trying to catch a glimpse of some of their fishy and spiky inhabitants. 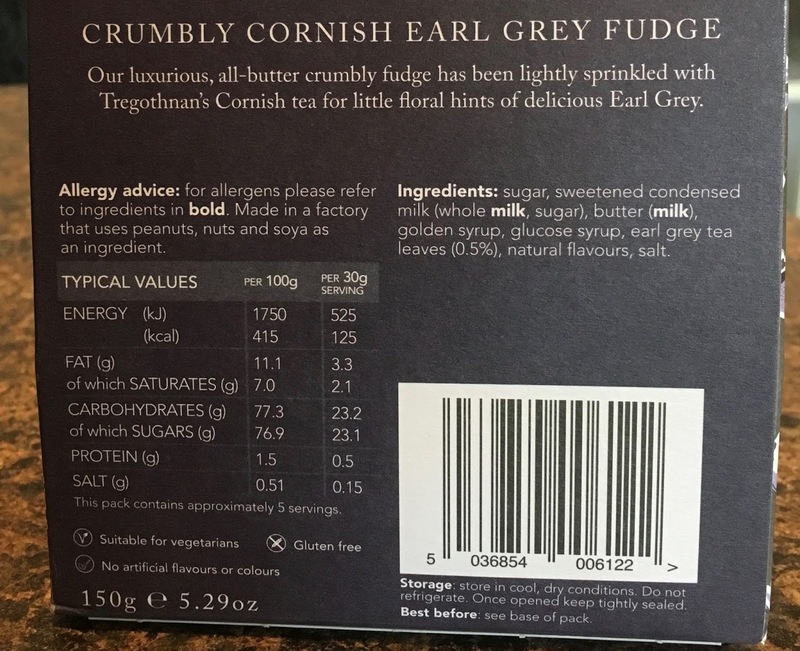 There was a whiff of Earl Grey tea to the fudge in the bag, more in the taste though. First there was the full gorgeousness of sweet butter fudge and then a slight citrus touch from the flecks of Earl Grey Tea. This is lovely sweet butter fudge in all its glory. It went well washed down with my mug of tea too. However, I could quickly see how the flecks of tea leaves could get stuck in between my teeth and could often feel them at the back of my tongue begging to be washed down. I'd prefer this fudge without the flecks and just left with their full sweet butter fudge confectionery perfection. 150g contains 125 calories per 30g serving, with 3.3g of fat, 23.1g of sugar, and 0.15g of salt. Ingredients are gluten free and included; sugar, sweetened condensed milk (whole milk, sugar), butter (milk), golden syrup, glucose syrup, earl grey tea leaves (0.5%), natural flavours, and salt. I don’t want to say that I don’t like ginger, I just want to start by stating that ginger isn’t usually a flavour I choose. If there are other options I tend to pick them over ginger, but weirdly I do like most warm spices, especially cinnamon. I felt I needed to add this little disclaimer before writing about this interesting drink from Nix and Kix, I suppose I should also add that mango is my favourite fruit! With all that aside, I cracked open the bottle of Mango and Ginger Drink Nix and Kix and poured some into glasses to try. The drink is a pleasant orange colour and has a gentle fruity smell and a light fizz. This drink has no added sugar, but not in the way that many do were they replace the sweetness with apple juice so you end up with a sweet drink, this is simply not very sweet. The flavour feels very grown up, and the mango is lightly sharp but very refreshing. I liked the taste, and after a sip or so got used to the flavour not being sweet, and really enjoyed the drink. The ginger, and indeed added cayenne, give the drink a warmth , but it is a gentle flavour, and for me well balanced. I don’t want a drink that burns my mouth, I just liked the way the subtler flavour of the spices enhanced the drink and made it more interesting. This drink was very different from most soft drinks, because of its reduced sweetness. The flavour held out though and the mango shone through. This is an ideal drink for those looking for a grown up soft drink, and it is from a brand whose other varieties I will now be exploring. The World Cup is great. The cinemas are empty, the bars without TVs are nice and quiet and you know you aren't missing anything on social media! Also there are lot of tie in snacks for people who aren't as excited by the prospects of their national team. I'm sure this has been around before but I'd not picked it up - so here is a pizza with a meatball crust! They both feature the word ball - so therefore it's a good tie in! It looks a bit different than my usual pizzas. Once you cook it and even it out then it's quite appetising. While this was cooking I nabbed a slice of a Dominos pizza though, and I think that set my expectations a little too high. This wasn't as sweet as that was, and didn't have explosive chorizo. What is does have is 12 meatballs, and some pretty decent sliced meats. It could have done with more tomato and some kind of veg in the middle to balance it out a bit, but this was a decent meal - I had half of it and the other half was shared out with others. We all liked it, but I don't think the flavours or the ingredients had the required WOW factor. Shame really, as I'm not a fan of the cheese crust pizzas so this would have been a good substitute. 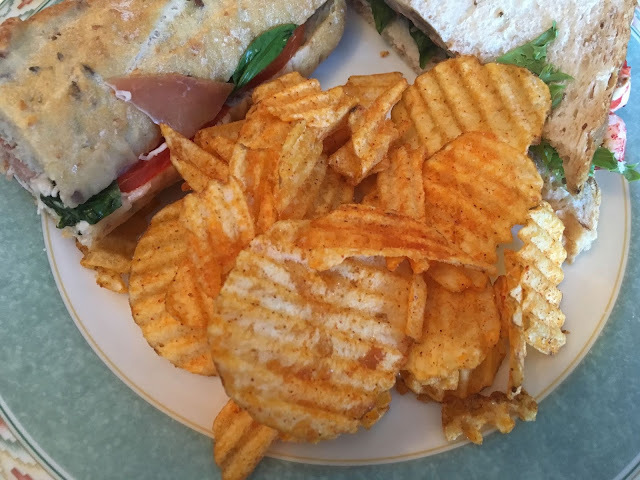 I often take review snacks out with me for the day, and on holiday, because it’s nice to have things to nibble on and the pics look good. 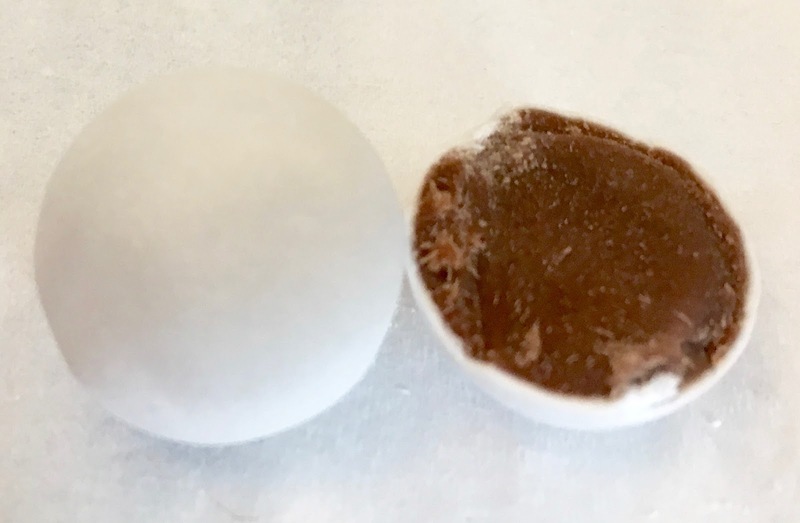 I picked up these Butterfinger coconut from the CoOp with the disappointing fusetea drinks, dropped them in the snack bag and them left them in the car in the direct sun. I’m not convinced that’s possible without a knife! 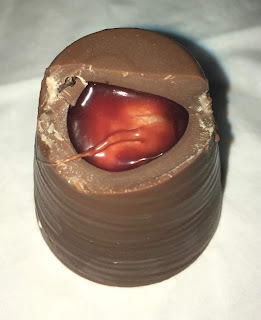 When I typed the title of this review I actually wrote Summer Fruits Walnut Whips; then I had to correct it. This is just because my first assumption on hearing about a chocolate whip is to associate walnut with them. 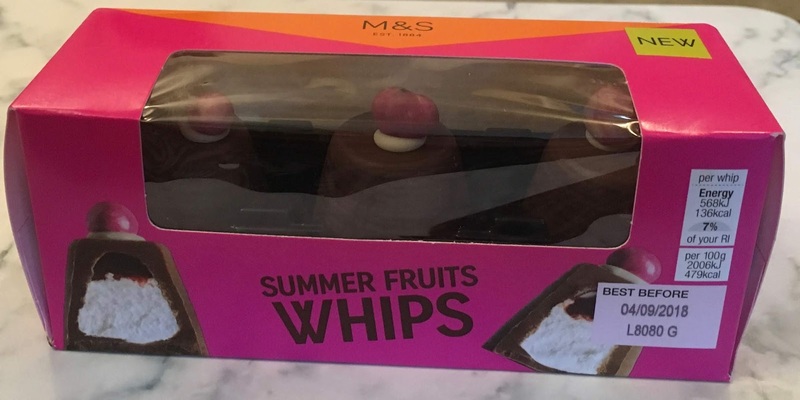 There is no walnut on top of these new Summer Fruits Whips from Marks and Spencers, but there is a fruit topping and a fruity sauce inside, all ready for summer. There are three in the box. 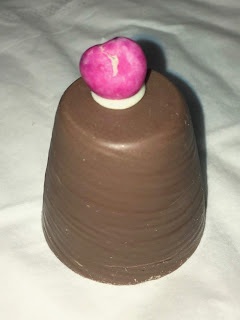 I started by trying the pink topping, it is a blackcurrant covered in white chocolate which is decorated. 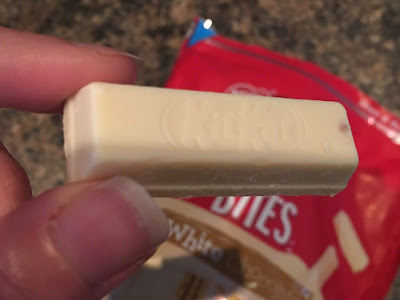 I have to say it was quite sharp, there was plenty of white chocolate and this helped mellow it a little, but ultimately this was a zingy start to the chocolate whip. The fruit sauce was inside and at the top of the whip when I tucked in. I kept these Whips in the fridge as it has been quite hot, and this meant that the chocolate was difficult to bite into, as it is rather thick. This does give a nice touch of luxury though. The flavour from the sauce was a much sweeter affair, and although it was mixed berries, strawberry shone through, and it was sweet and fruity. Strawberry and chocolate does work well and this with its light whipped mallow filling ended up tasting like a giant strawberry cream. Definitely an ideal treat for summer. 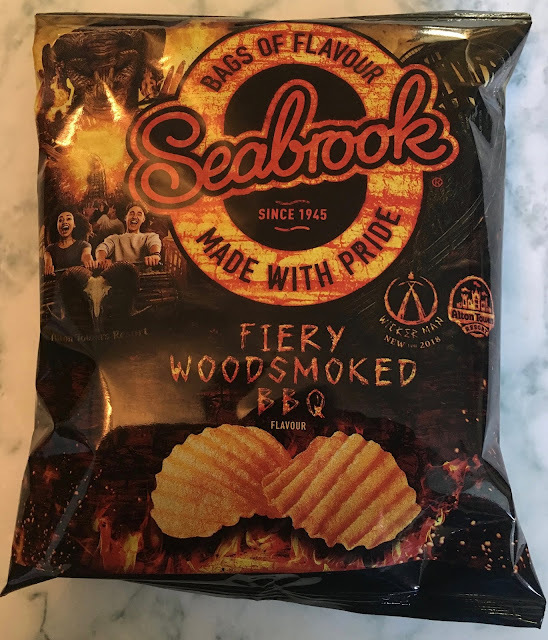 These crisps were brought online from Ocado, and I wasn’t completely sure what the newness was from them from the name. I think I decided it must be the extra strong cheese flavour, and added them to the basket. They are called Hula Hoops Flavarings so I knew they were all about the emphasis on flavour. They arrived in a very big bag that still felt quite light. 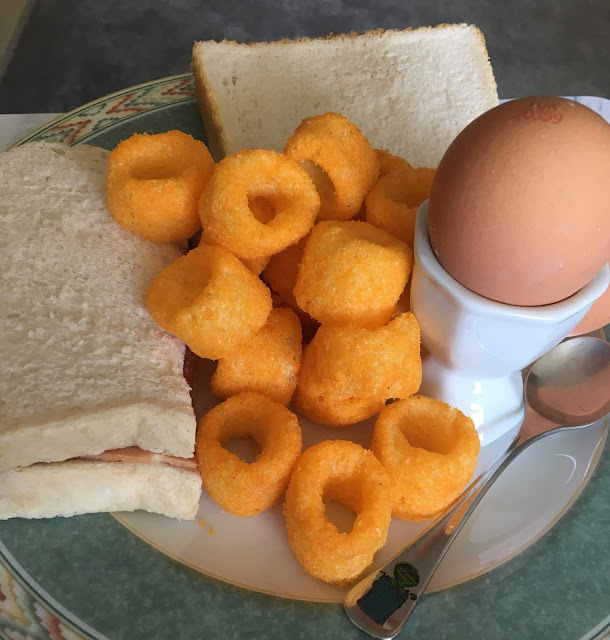 We shared them out over a brunch, with sandwiches and some hard boiled eggs that needed using up. A bit of an off combination I know, but sometimes the fridge dictates such things. The minute the bag was open I realised that these were something a bit different, for a start the the Hula Hoops were huge! They are fairly light in texture, and felt nice and crispy. The cheese flavour is strong, but pleasantly so and not too musty. I liked the texture and enjoyed munching on them, they feel big and substantial but easily melt away in the mouth. The cheese was tasty, and my fingers were left tinged with yellow cheese crumb, which reminded me of my childhood. It felt like it tasted like a strong cheddar flavour but was very well balanced. 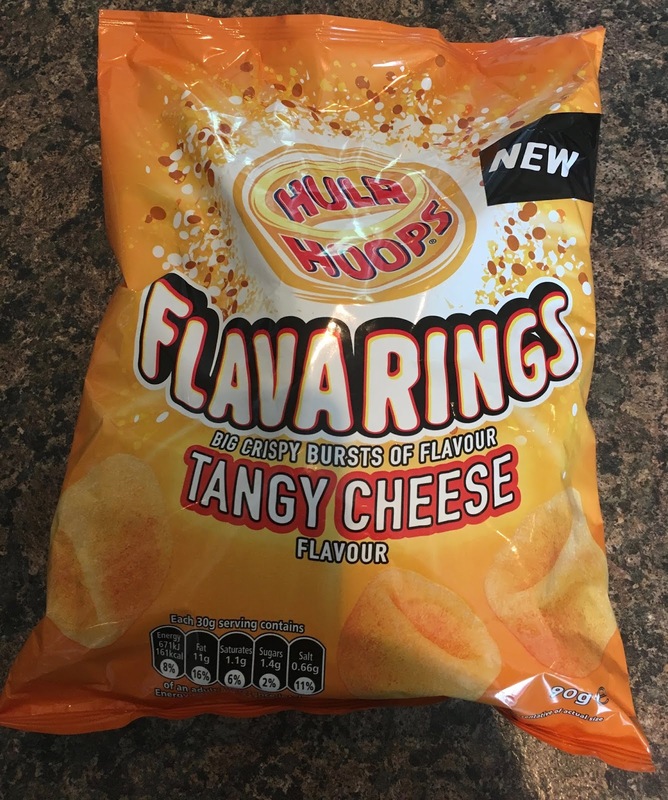 I’m looking forward to trying the salt and vinegar version of this new Hula Hoops Flavarings too, and have a bag of those in the cupboard. Heading out for the day in the Lake District for the Great North Swim we picked up a couple of nice cold bottles to see us through the day - choosing the currently heavily advertised and discounted to a pound a bottle Fuzetea. I like ice tea, so thought this would be a fairly safe bet. Looks like red drink, tastes like slightly sweet water. I mean there is a hint of peach, and maybe a hint of tea, but it’s mostly sweetener and water. 5% peach, and 0.12% tea. It’s not exactly revolutionary - just sweet water. Let’s see if the Mango version is more exciting. More realistic colour. Same invisible taste. Turns out it’s made by a Coca Cola, which explains its sudden appearance on all of the adverts. It also explains why it’s basically tapwater with a squirt of concentrate in it. If you want to drink those barely flavoured water drinks that already exist then this is a fairly uninteresting addition to the range. If you want to pay £1.50 for a 400 ml bottle of artificially sweetened water be my guest. I think I’ll stick to the teas with more tea in them, or a 5 times as large bottle of plain water for the same price.